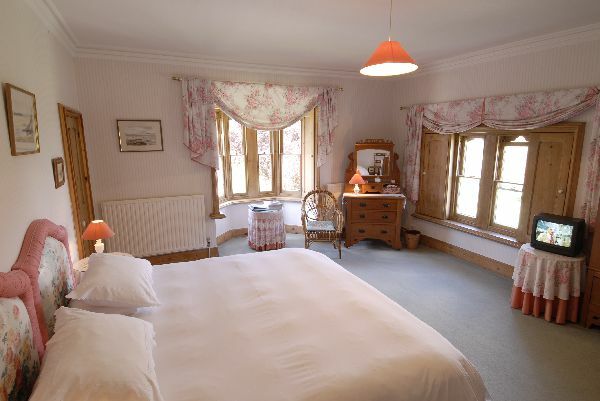 All of our bedrooms are very large and, being double aspect, provide outstanding views over the surrounding countryside. They are fully equipped with flat screen colour TV and a hairdryer whilst our hospitality trays are well stocked for your use. In your en-suite or private bathroom you will find an array of complimentary luxury toiletries. We also have an ironing board and iron for you to use and can also provide a drying area for drying out wet walking clothes. Our bookshelves are well stocked with a selection of books and quality magazines for your reading pleasure. For more details about what you'll find elsewhere, please visit our Nearby page. All our bedrooms can be Family Rooms. Our "Summer" themed bedroom has blue striped walls. 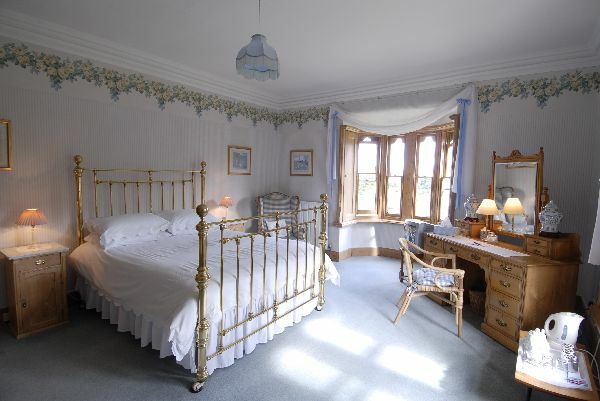 It has an outstanding original Victorian brass bed and spacious en-suite facilities in the turret with a power shower. Our "Autumn" room has beautiful window shutters, complimented with a decor of warm coral and cream. 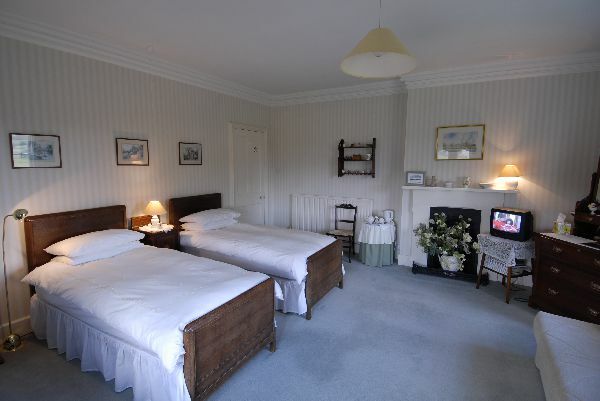 The beds in our Autumn room can also be zipped together, giving you the choice of Twins or a SuperKing. It has ensuite facilities with a power shower. The "Spring" bedroom is decorated in spring fresh pale green and primrose yellow with a finely crafted carved Arts and Crafts suite. The beds in the Spring room are "Zip and Link" which means they can be configured either as twin beds or linked to make a Super King Size Bed and this room also has a comfy sofa-bed. It has private facilities next to it, with a power shower. After 72 hours - full payment will be taken, unless we can re-let the room in which case just loss of deposit will apply.